I really want pizza. But it blows my tummy up like a balloon and leaves me bloated and yuck. So I thought I’d try something a little different as an experiment. If the carby crust doesn’t sit well with me, I may as well try another kind of crust. I’m not going to pretend this is super healthy, but it could be if you made a few little changes. Plus it does have high protein and a few veggies. Meatzza worked a treat! Sweet potato pizza base worked. Why not a pizza frittata? Even better – a pizzata! Badum tish! The best thing about both frittatas and pizzas is that you can pretty much throw anything into it that you like, to make whatever flavour mix catches your fancy. Go crazy. 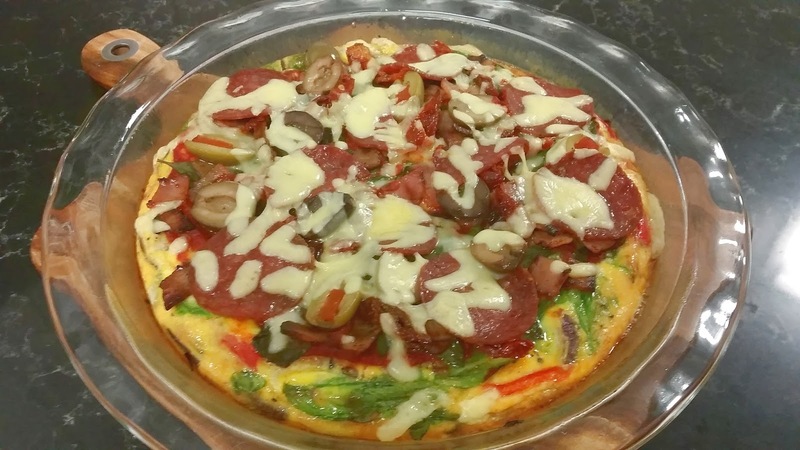 I’ve opted to put a few veggies into the frittata base and then use things like sun dried tomatoes, olives, pepperoni and bacon as toppers, but you could change that up or just throw all of your pizza flavours into the frittata instead. If you want to reduce the fat, skip the feta and grated cheese and just dust with some parmesan cheese instead. You could also use 5 whole eggs, and 6-7 egg whites to reduce fat as well. Whisk eggs, milk, salt and pepper, then pour over the vegetables. Place in the oven for approximately 20 minutes or until almost cooked. The top should be cooked just enough to be able to apply the sauce without it sinking into the frittata itself. Remove from heat, and gently spread the sauce, using the underside of a spoon. Top with other toppings and cheese. Return to the oven for approximatley 10 more minutes or until cooked through. This breakdown includes my chosen toppings. Adjust it if you have different toppings. FYI – you will need a knife and fork with this. I’m not sure if it needs saying, but (just in case) please note that you won’t be able to pick this up in your hands like a normal pizza.